At that time, I had meat or dairy or both in almost every meal I ate, and I really had no idea where to start or how to make being a vegetarian practical within in my life. But I decided to try as there were lots of reports of energy going up - even though I really thought people were just saying that to push veganism. Within one week, however, I went from running on about 30% to 70%! Following that, I learned about the ethical and environmental side which helped cement the diet for me. Winter was pretty easy but, as the agility season began, I suspected that I would find things more difficult. I knew the amount of travelling would make it more difficult. It was going to be a big learning curve. To begin with, I found veganism to be expensive. This was mostly because I was buying loads and loads of fresh veg and either running out or it would go off quickly. I was still experimenting with what meals suited me and my lifestyle the most, so I did spend quite a lot on food in the first month. However, as I discovered tips and tricks such as buying frozen veg, I spend a lot less on food than I used to. So I decided to create a Facebook support group for me and eight of my veggie friends so we could share ideas and experiences on things like what we could eat at shows and on training days. I certainly did not expect the response I got! Amazingly, the Group went from nine to 350 members in just one month. 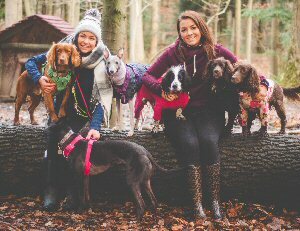 While it is open to everyone, it is mainly for vegans, plant- based vegetarians and people on restrictive diets in the Agility and dog training community. Not everyone is completely meat-free and we’re not all completely healthy. We definitely still love junk food. Members include people with allergies and others wanting to transition as well some people simply wanting to reduce their meat, but not necessarily stop completely! What it's not is a weight loss group. 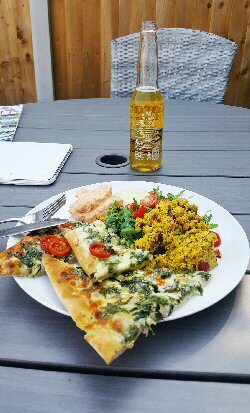 What most of us agree on is that catering at agility shows isn’t always very veggie let alone vegan friendly. We really don't love greasy catering vans every weekend. The VVA chat is great. Thus far, everyone has been extremely friendly, supportive and non-judgmental. We discuss food ideas every day and post pictures of meals, recipes, exciting supermarket finds, etc. Meal preps suddenly seems so much easier with loads of suggestions and advice. And, of course. we all are united by our love of dogs. We do have a rule that no preaching is allowed. We believe that if someone wants to make a change it's much more effective for them to do it in our own time with positive support. No cruelty posts allowed either - another biggie to us! Even before I had no dietary restrictions, I generally only ate as lightly as possible (yoghurt bars etc.) at shows at least until the evening. Although agility isn't a particularly strenuous sport in terms of exercise, I do find it hard to run when full of heavy food. As I can’t even eat most of my light food choices any more, the Group has been incredibly helpful with ideas! Avoiding the grease and sticking to plant-based food has helped me so much. It feels much easier to run, and I’m not getting as tired at shows. Still not completely healthy - I am obsessed with paprika Pringles - but the difference feels huge. Since starting the group, we've been able to highlight which caterers are offering what and at what shows. At the moment, however, this is mainly just 'praising' a show that has had an alternative caterer but very often we only finding out until the day. I know that caterers are usually listed in the schedule of a show, but their menus aren't so ideally we would ideally love to create a website that gives everyone a heads up on what food would be available that day. This is still in the planning stages though, and we'd love to hear other people's thoughts! When I agreed to write this article, I decided to ask some other members for their comments. Although 100 % veggie and 99% vegan now -barring accidental slip ups - Co-Admin Chloe Machon is still learning. Every year since she was five, she'd had extremely bad eczema. No sign of it so far this year! She just hadn't been educated on what actually happens to animals in the process of it all, but she is trying to live an animal cruelty free life from food to every day products she uses. She started the process very gradually. Her diet has never really been meat or diary driven although she thought it was. It was always an extra to her meals. So when she started living on her own and saw just how expensive meat is, she started to make changes. She started by cutting out all meat apart from chicken and fish from her diet. Then she realised that she wasn't missing meat and that meat wasn’t bringing the flavour to her food.It was the herbs, spices and sauces that she actually enjoyed. Next she cut out chicken and about a year ago she stopped eating fish, too - even though she loved sushi! She found that she didn't miss meat at all. This year she decided to go the diary/egg free life. Although she had always tried to make the best ethical decisions when buying animal products (free range etc), it wasn’t until she watched Land of Hope & Glory and UK Earthlings that everything changed for her. She realised that free range does not really mean 'free range.' It was a huge turning point in her life. Chloe watched a few health documentaries about 'plant-bsed diets' most of which she took with a pinch of salt, but some of it still made a lot of sense and she felt the changes personally. After following a vegan diet, her asthma has almost gone and her energy levels are much higher. Sam Clarke has found the V & V Agility group very inspirational to get her eating back on track. Being gluten-free, s it’s not easy to stay inspired for new ideas. There are some wonderful recipe sharing. She is hooked on the Bean burgers which taste amazing. They just don’t look like the group member's photo... yet. Another member, Judith Falkner, is not particularly veggie or vegan but she too is loving the recipes and ideas for healthy eating. She does not eat much meat but has never enjoyed vegetables much - her parents boiled them to death and things like peppers and avocado etc were non-existent when she was young. She is very happy trying out anything tasty. Kayleigh Guilford was delighted to find out that she was not alone. She went vegan in March 2017 when she couldn't justify loving dogs, cats and horses while still eatung other living creatures! In terms of her diet, she hasn't looked back. She reports that she is in the best shape ever and feels healthy and strong. At the start of the year, Yvonne Lynch started experimenting with a plant-based diet. She'd make some changes so she eating vegan one day of the week when she joined the Group. As a result, she now has lots of ideas and has decided to take the plunge. It's important to note that we still feed our dogs meat - most of us being raw feeders. We know that some would say that is hypocritical, but we also appreciate that it’s not possible to be 100% ethical in today’s day and age. According to ACE (Animal Charity Evaluators), going vegetarian in the UK can potentially save 24-110 animals per year, and according to the web site Veganuary - the minimum when going vegan is even more. Chloe and I are very proud of the group! It's so polite, friendly and encouraging. If you are interested in learning more, please do check us out. You can find us on Facebook. We LOVE food and have so many different ideas! Cat Clark (24) lives in Cambridge along with her partner Maciek and their three dogs. 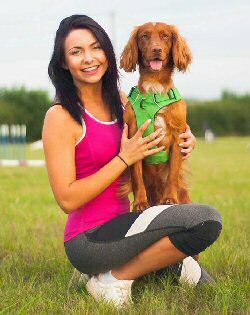 She started agility at 11 years old, and currently runs her young Working Cocker Spaniel called Toast. Cat and Maciek both work for a software company, but outside of their full time work they also run a digital design business specialising in branding for dog trainers. She is also launching her first official line of agility clothing this year. 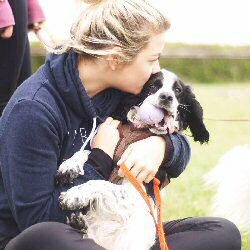 Chloe Machon (23) works in Payroll/Acounts and currently lives in Milton Keynes with her sister and sister's partner) with their five dogs. She caught the agility bug in 2004 and has been hooked ever since! She is currently competing two Cocker Spaniels in Grade 7.